Jesus said, “Consider carefully how you listen…” (Luke 8:18). It’s equally important to Choose Your Words Carefully. What is in your heart will eventually come out of your mouth. The devil uses our words against us! There seems to be agreement among those who teach the Word of God that the devil cannot read the thoughts in our minds. One teacher wryly observed that the devil doesn’t have to read our thoughts because he put most of them in there. However, although the enemy may not know what we are thinking, he can hear what we say, read what we write, and observe what we do. Our negative words and actions give the devil a legal standing in the court of heaven to use our own words and actions against us. That’s why you should Choose Your Words Carefully. That’s true in human courts of law, and it’s also true as our accuser attempts to get a ruling against us in the court of Heaven. As we know, Satan and his demons burn with hatred for Jesus. But, much to their dismay, Jesus defeated them and purchased our salvation by taking human form and sacrificing Himself as full payment for the sins of all who choose to follow Him. Because Jesus loves us that much, the demons in hell hate us. They can’t touch Jesus, so they do the only other thing they can do: try to destroy those whom Jesus loves. THAT’S US! Fortunately for us, God has restrained these fallen angels from killing us all instantly. But, because God has given each of us a free will, He cannot stop us from choosing to reject Him. That’s what most people do. One common way in which we all fail to follow the model Jesus gave us is by saying and doing things that give “opportunity to the devil” to attack us. Here are just a few examples of things not to speak or write or do, followed by a more biblical response. Do you ever say, when someone has a cold or the flu, “Oh, I’m sure I’ll catch it. I always seem to catch what someone else has.” By saying something like that, you could be giving the devil an opening to go before God and demand the right to infest you, because you as much as invited it upon yourself. Instead speak words of faith: “Father, how grateful and blessed I am! Because I know that, according to Psalm 91, You will protect me from ‘deadly pestilence’ and ‘no plague shall come near my tent (my body)'”. I remember seeing many times a slogan thumb-tacked to the partition in the office cubicles of various people, which read: “I always dreamed of making the salary I’m now starving on.” This negative attitude could be giving the devil an opportunity to attack their finances. Do you put yourself down? Saying things such as, “I’m such a klutz”; “I’m so stupid”; “I can’t do anything right”; etc. Instead, if you just did something klutzy, realize that the devil is right there watching for you to give him an opening. Say to him, “Did you enjoy watching me do that just now? Well, that’s all the satisfaction you’re going to get from me. I won’t make that mistake again.” Then give praise to God and ask Him to help you guard against such mistakes in the future. And if you should happen to make the same stupid mistake, don’t give any satisfaction to the devil by dwelling on your failure. In fact, every time the devil reminds you of your past, you remind him of his future! Do you do this? I used to know a man who, when something would confuse him, would say, “Oh, my brain just isn’t working right today!”. That’s not walking in agreement with God. Again, it could be opening the door for the devil. If you’re always putting yourself or others down; if you go around with a chip on your shoulder; if you are one of those for whom the proverbial glass is always half empty (or completely empty); If you deem it your role to critique and bash every imperfection in the world around you; as far as the devil is concerned, you have a “Kick Me” sign on your back! God is in control; the devil has to seek permission. Thus the enemy tempts us, entices us, lures us, waiting and watching for us to go for the bait. When we do, just like a sleazy shyster lawyer, he goes before God and accuses us in an attempt to gain permission to inflict misery upon us. Can you see from that how relentless Satan and his demons are in their zeal to attack us and bring us down? They consider everything we say and do, hoping to find evidence against us. This is definitely a supernatural problem. And supernatural problems require supernatural solutions. We cannot combat Satan and his demons on our own. We need God’s supernatural help. Knowing the enemy takes study and practice. You could read about or hear about how to play the guitar. But that’s just the first step. In order to actually do it, you have to practice. In the same way, if you want to be victorious in these spiritual matters, you have to commit yourself to it. 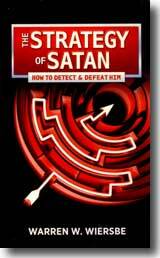 I’ve written many articles that deal with spiritual warfare, and how to defeat the devil. There’s a list of them near the top of the sidebar at right. Also, I highly recommend the book described directly below. The devil knows those Scriptures. He knows how difficult it is for us to control what we say, and like the bully that he is, he seeks to exploit our weakness. But we have the ultimate weapon: the power of the Word of God. slow to anger — which I can do with God’s help! The more Scripture I know, the more God is able to use it to teach me, reprove me, correct me, and train me in regard to my own behavior. So, instead of giving “opportunity to the devil”, I’m giving “permission to God”! Warren W. Wiersbe is a Bible teacher, author, and conference speaker. The cover design shown above is a special design for Turning Point Ministries. Copies of “The Strategy Of Satan” purchased online have a different cover design. Most of this makes sense & has given me a new perspective but I do have a question. From what I’m reading you’re saying that the devil can’t do anything to us without 1st asking God and God has to give him permission. If that is the case couldn’t people use the argument that bad things happen because of God because He could tell the devil no? My understanding has always been the devil does what he wants against what God wants & that’s why he was cast out. Not that he’s granted permission to do what he wants. Im fighting demons that r inside me!!! Actually serpents ivd havd dem for over 10 yrs. Inside me but i thought dey wer gone now da priest dat supposedly helpd me died and i dont know wat to do??? I pray dem out but dey keep jumping back inside me!!! I need real help!!!! I want dem to stop jumping back inside me!!!! Ps i can answer u faster if u text message me i rarely look at my email and i rarely answer my phone bcuz of so much scam!!! Bfor u start wanting to charge me i dont hav money i need help!!! Pleaz honor me with an answer at 830-319-6780 BLANCA!!!!! All your information was very helpful. Thanks! Glynis, thanks for your gracious words! It’s my privilege – my joy and delight – to serve God in this way by giving to others what He has given to me. Thank you for your kind words, Ron. And thank you for the blessing you prayed over me and this micro-ministry. It’s all His doing. Thank u for every effort you’ve made to bring out truths. I mean how they read words that are written which are not spoken out. So from this we know that they can read. Satan and his demons are highly intelligent beings. But they don’t know everything. But their goal is to trick you and try to throw you off-guard if they can. Since I was very young I was taught that spoken words could be used against us by Satan . I never knew written words could be used by Satan as well. Please show me where to look in the word to study on this subject. I cannot recall a passage that expressly addresses written words. (or our actions, which the devil also uses against us), but I do know that the devil accuses us continually, in any way that he can, to give him a leg to stand on when he accuses us before God. As I began to read this article, I felt it was going in the right direction, but, when I came to the part that talked about a person with a cold and if we answered ,” I’m sure I will catch it…”, that’s when I stopped. You wrote that the devil can go before God and ask to infest us, we’ll, you are wrong there. In the Old Testament, satan did go before God when he wanted to attack Job. You seem to have forgotten that when Jesus died, He went down to hell and took the keys away from the devil. Meaning: He arose from the dead and ascended into heaven, is seated at the right hand of the Father. The devil was defeated and is under His footstool. Meaning: the devil can never again go before the Throne of God, touch any part of heaven, he was completely banded and cast down. You have it wrong. What you are implying is that satan still has the ability to enter heaven. No way! Go back and read it over again. Ask our Lord to explain it to you. I pray you read this in love and brotherhood in Christ Jesus. Amen! Thank you so much for raising that issue. Because if you’re seeing it that way, it’s likely others are, too. By the way, I appreciate your politeness in your comment. And you are right – in part. True, the devil is defeated, but he certainly is still alive and trying with all his wicked demons to take all of us to hell for eternity. Agreed? Of course, Peter was speaking figuratively when he wrote that about them devouring us. But I know that the goal of Satan and all his demons is to take every soul to hell for eternity. If they could kill us all, the would have. 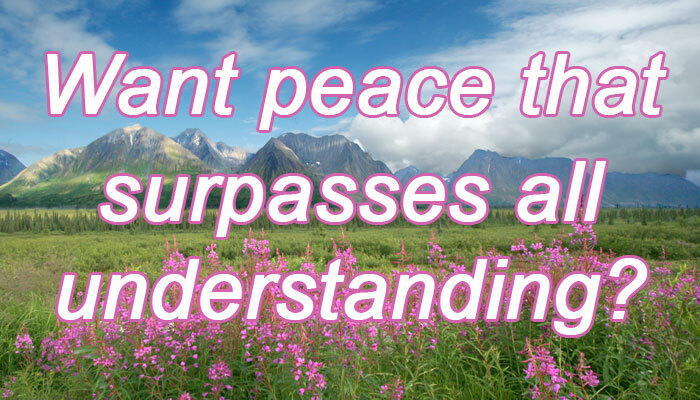 But God is restraining them. They can go just so far… but no farther. God has to approve everything they do to us. Pastor James MacDonald (Walk In The Word ministries) has used the expression, “God has him on a leash”. and watch how they write post headlines to get viewers interested. When I was a small man my father thrust his words deep inside me with such force that I would emotionally cower from God’s love. Then one day I fell to my knees and received the Lord inside me deeper than my father’s deep penetrating hurt. Praise Him!! One difference between your human father and your Heavenly Father is that God will never force His Word or His help upon us. Each of has to ask.